I knew a little bit about this book from seeing the previews for the movie on television...That is to say, I knew that the main character, Lena, would be claimed for light or dark on her 16th birthday. That was actually it. Beyond that, I wasn't sure what to expect because these types of books can go in just about any direction. This one is set in South Carolina, in a small town where everyone knows everyone and everything is generally predictable. I immediately related to the small town feel because I live in a small town. So for me, the southern small-town backdrop gives this book a homey feel. I was pleasantly surprised that the story was told from the point of view of Ethan, the main character. We join him when the girl he comes to love is only a vision in his dreams--some very strange dreams. When she comes rolling into town, he's pretty blown away and it is from there that everything begins to unfold. The characters are vivid and I enjoyed giving them all strong southern voices in my head. When it comes to books with supernatural elements, I am always curious to see how authors will spin the tale of the magic and the specifics that govern those powers. Garcia & Stohl did a great job painting her world of powers with the Casters in this book. It's unique and interesting. And I loved that in the predictable small town, nothing was really as it seemed. This really allowed me to enjoy the journey as it unraveled. Then, of course, we've got to talk about the love story. It's a pretty PG love story, but you know, that didn't bother me in the least. It was sweet and courageous; deep and simple. Right from the beginning we know that their relationship will be tested with great odds, and I was rooting for them all the way. The writing was, like the love story, simple. There was nothing to overcomplicate the book in the way of flowery language, and I have to applaud that because it's not always easy to do write without complication. Nonetheless, Garcia & Stohl accomplished this and kept it interesting...she had me turning the page eagerly and there is nothing I love more than getting wrapped up in a good book. Beautiful Creatures totally fits the bill. As for the movie? I haven't seen it, and I'm not sure if I will or not. I have it on good advice that the film was not as strong as the book...and I hear they changed the ending. Bummer because the ending is perfect. 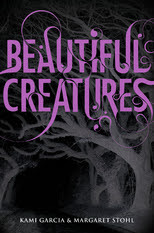 I can't wait for the saga to continue in the next book, Beautiful Darkness.